My good friend Nanci and I have known each other since we were about 14 years old. She’s one of the smartest, funniest and most talented people I know and I love her to pieces. I’m not sure exactly how the seed was planted. I think my girlfriend suggested we do it so I brought it up and then bullied Nanci for months, until she finally agreed to it. We started brainstorming over supper at her place one night, which brought on the onslaught of ridicule and sarcastic comments the kids. It’s in the baby-fresh beginning stages so we’re just figuring out the difference between gain and volume control, sound cards and audio interfaces, honesty and oversharing. But if you want to be able to say “I knew them when” and not be lying, I suggest you bite the bullet and get on board now while we’re still learning how to “walk”. We have a ways to go but we’re on the same page. We had a dream. Many dreams. Some of which expired ages ago, others that we still cling to desperately, and others that have blossomed and evolved into bigger and better (or just other) things. 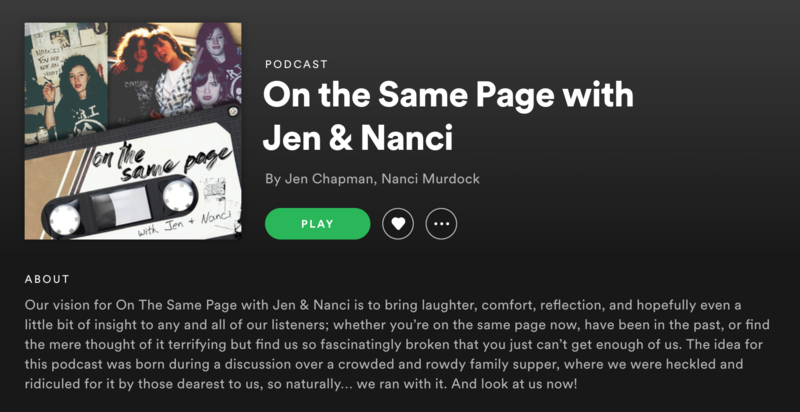 On The Same Page with Jen and Nanci is an exploration of some of these dreams, our fears and inspirations, and some of the obstacles we’ve encountered and the tools we’ve experimented with while working toward them. Spotify has agreed to love (or at least accept) us for who we really are, and so have we! Previous Post - Previous post: Is there such thing as too much Self Care?